Easter Mantel - Take Two! I some how deleted the first post I did - so this is going to read quite different from the original post! 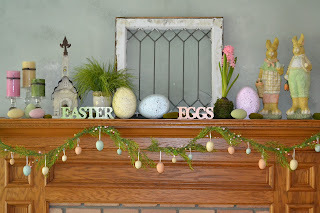 I went a little Easter Egg Crazy with my mantel this year. 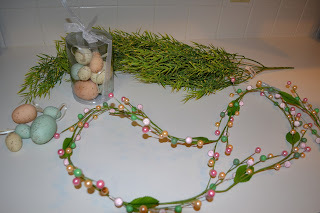 I made the Egg Garland from a piece of greenery I bought for $6.99, a spring garland I purchased at Joann Fabrics (with coupon I paid about $4.00 for it) some eggs I had with hanging ribbons already attached and some fishing line. I cut up the greenery and the garland and used the wire from ends of each piece to wind together until I had one long piece. 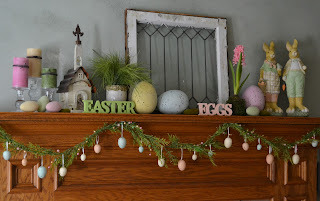 I tied the eggs on with fishing line instead of having the ribbon over the top of half the greenery - they just hung nicer this way and used 3M hooks to hang it. 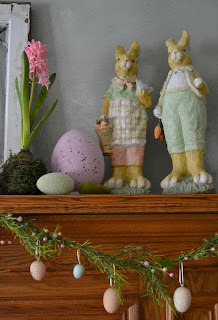 I found these two bunnies at Stein Mart - they spoke to me!! I had the various sized Easter Eggs to place around and added one of my favorite spring flowers, a hyacinth. 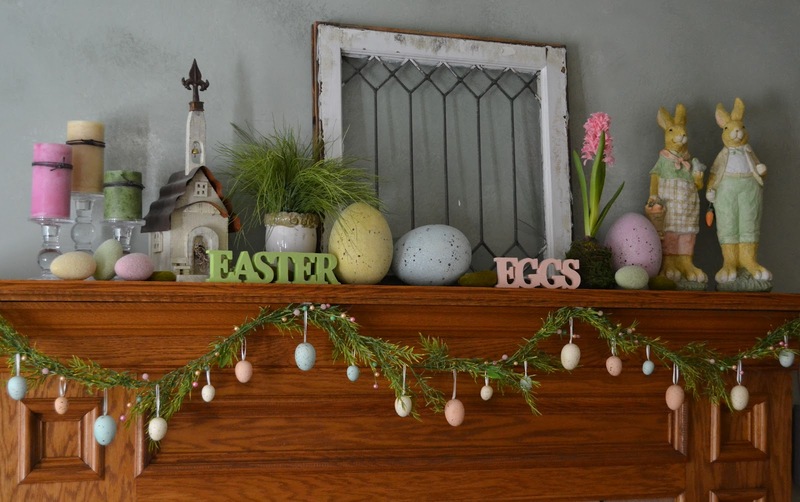 Wishing you an Eggsellent Easter! Thanks for hopping by! 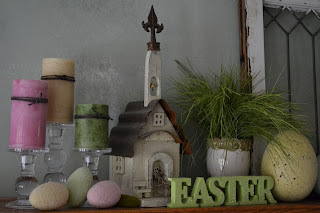 I love your Easter decor it has a cool shabby chic look! Thanks Alicia! I had fun putting this together - the bunnies just called out to me in the store!